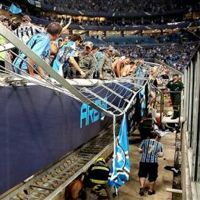 Seven people were taken to hospital as they fell several meters down at the new stadium in Porto Alegre. None of them was seriously hurt, thankfully. The fall was caused by a steel barrier, which didn’t withstand fans pressure. In Hungarian city of Debrecen works on demolition of the old stadium have just started. In Mexico, on the other hand, existing structure is being constantly expanded by new sections. Whatever way, both stadia will end up really well! Despite host club claiming it’s only a ‘minor flaw’, stadium operator admitted today that masses of ice and snow tore holes of significant size in three parts of the roof. Had this happened during a game, many people’s life would be at risk. 30.01.2013 Euro 2020: Belgium joining forces, Brussels to get new national stadium? Current Heysel is most likely to disappear, but Belgian FA wants to build a new national arena. Under one condition – Belgium needs Anderlecht to become the main tenant and… investor. Sporza.be reports. 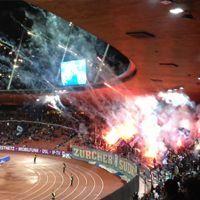 As promised back in October, Zurich commissioned testing of flares inside the stadium. 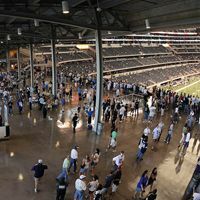 Not during the game, but with empty stands. This came after football authorities blocked testing with fans inside – 20min.ch reports. One of these stadiums will not get built, but is still definitely worth a glimpse. 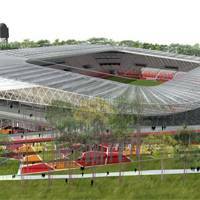 The other is increasingly likely to take shape in one of Poland’s least developed regions, becoming a major athletic and football stadium. 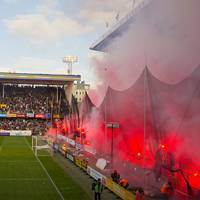 29.01.2013 Sweden: Pyrotechnics may soon be legal? Under what conditions, which materials? That’s unclear until late March, but national coordinator for sports-related violence says he can see support for a solution to be found. Fotbollskanalen.se report. 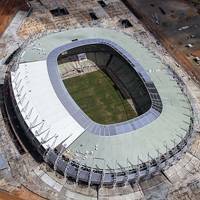 Two games in one day marked the occasion of first football matchday at the redeveloped World Cup stadium in Fortaleza. But even summarized, both fixtures’ crowds wouldn’t fill the stadium. Works on the new 20,020-seater are set to begin just three days after tender validation! Demolition of the old stadium will begin tomorrow and in a year we should see the structure of new stands at that location. 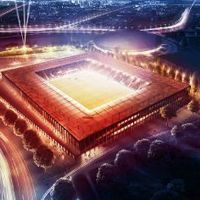 After over a decade of attempts and different visions it seems to be in place – the plan for a new Brentford FC stadium. A new and completely unique 20,000-seater may be opened in London in mid-2016. Shocking news from Egypt, where 21 people accused of causing last year’s slaughter at Port Said Stadium have been sentenced to death. As the verdict was announced, families of the victims cheered, but in the streets of Port Said people started dying in clashes with police and military. 24.01.2013 Sydney: ANZ Stadium to get retractable roof? 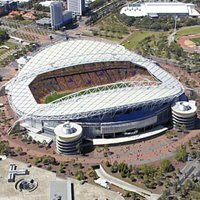 Australia’s renowned Olympic Stadium from 2000 may be getting a significant makeover, if the operator succeed in plans announced this week. A transparent retractable roof over the pitch is on the agenda, Sydney Morning Herald reports. One of England’s most recognized clubs seems to be losing each piece of land they publicly express interest with. First they lost the Battersea Power Plant, now Earls Court. 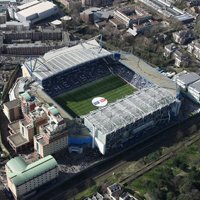 What’s more, local council expressed “firm belief that the future of Chelsea FC is best served at their historic home of Stamford Bridge”. 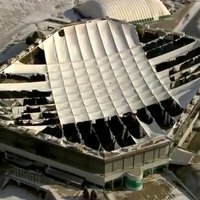 It’s been two days now since media storm began over Silverdome roof, which has been torn vastly by cold winds. But venue operator assures this is a good thing. Why? Central not only for the city, but the whole province. Largest stadium in Indonesian Riau joins our DB today, but is also the last venue you asked us to nominate for the Stadium of the Year 2012 award. Be sure to check it out before you vote! Out of six companies expressing interest, only half decided to compete for the nearly $1 billion project. Potential income from the deal is expected at $13-27 million for the winners. Best league in France has some modest stadiums that we lacked in our database. Today it’s time to make things right and present to you Annecy, Ajaccio and Brest. It may be a rare sight for African clubs to finance their own grounds, but member assembly approved the investment for Yanga, one of East Africa’s most popular sides. New 40,000-capacity venue is expected to open in mid-2015. As almost all of Amsterdam Arena was ecstatic with the 3:0 victory in 87th minute, a significant mass of snow fell onto substitute benches and first rows of seating at the main stand. Thankfully it’s been funny rather than scary, no-one was hurt. 20.01.2013 USA: Santa Clara giant won’t get a naming rights deal before opening? Though it’s among the most expensive stadia ever and is being built in the largest naming rights’ market worldwide, new venue outside San Francisco doesn’t have prospects of getting sponsorship soon. But investors assure they’re just waiting for the right partner. Consortium named simply “Hajrá, Debrecen!” (Go, Debrecen!) 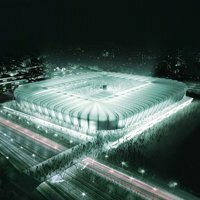 won the tender for new municipal stadium, one of Hungary’s largest football projects in decades. If no appeals are filed, the arena should be built for almost 10% less than expected. From several hundreds to a few thousand people – depending on source this is how many people gathered in Cairo to demand justice in a trial that has heated Egypt for the last year. 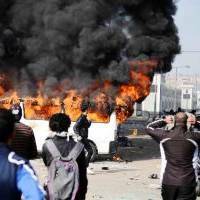 74 people killed at Port Said Stadium still need to have justice, claim those gathered. 18.01.2013 England: Wembley name for sale after all? Negotiations are done, contract awaits signatures – major English media outlets suggest. This will be Wembley’s first naming rights deal. Previous attempts have raised serious concerns, how will it be this time? It would most likely be among Euro 2020 venues if not for UEFA’s decision to change the formula. 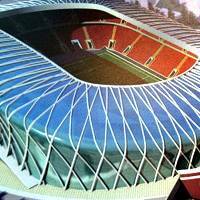 But now the new 42,000-seater in Konya faces a different problem as general contractor went bankrupt. The revived club wants to develop a second football-specific stadium for Long Island. After the MLS suggested Flushing Meadows, NY Cosmos want their own 25,000-seater and much more, just a few miles away. After turbulent years Iraq is now undergoing a construction boom and stadiums are one of its most visible examples. Today one more Iraqi project joins our database, both as design rendering and construction site gallery. The great classic of global football, Brazil vs. England, is now confirmed to reopen the record-breaking stadium this June. All sounds great, but that gives hosts just 5 days to prepare the venue. This was supposed to be the first naming rights deal in history in which the sponsor doesn’t pay, but even receives money each year. But instead of a 6-year partnership, the contract was terminated yesterday. 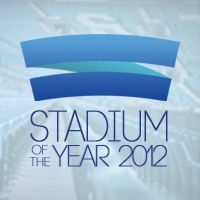 Third time overall, but first time in English, we’re proud to invite you to participate in Stadium of the Year award, 2012 edition. First phase is completing the list of nominees. We created an initial one, now you can check it and modify, if you feel we missed a venue worth voting on. It’s been over 8 years since Euro 2004 ended, but Portuguese hosts from Coimbra only managed to pay for a third of their stadium. Currently almost half of the city’s debt is caused by the stadium built for UEFA’s tournament. The club isn’t in a condition to fund its own ground, but the city may be, especially if EU funding is provided. New football venue might be ready by 2018 – JenaTV.de reports. 14.01.2013 Brazil: Third delay at Maracanã, when will FIFA lose their patience? Already in 2010 the schedule seemed to be a tight one. It also seemed that FIFA wouldn’t accept any slips. But as we hear about third postponement of venue delivery, the governing body remains calm. Supporters of FC Zbrojovka Brno organised a very colourful pyrotechnics display, which changed their stadium into flaming inferno. There's just one thing – the stadium has been closed for a decade and is literally a ruin. Wroclaw stadium operator left many observers stunned when it announced portable toilets are being considered in the away section. Reason behind the idea was the fear that existing facilities may be targeted by hooligans. We know the complete list of 6 bidders hoping to grab the nearly $1 billion contract for Vikings Stadium. Three of them are local, same amount based in more distant locations. Winner expected on Feb 1. It seems recent rejection of away tickets by Manchester City has been a strong signal that change is needed. Largest fan associations in England announced they will soon launch a campaign to cap ticket prices. The club has been maintaining that building a new stadium is the only way and hasn't considered asking supporters for their views on the case. Since Feyenoord didn't, their opposition used the chance and ran an extensive survey about the plan. Outcome shows massive scepticism for a relocation. It was supposed to be rebuilt some 5 years ago, but design has changed completely since then and is now under construction. First stand in May, by mid-2014 two more should come, enclosing the ground that will only have its main grandstand unchanged. After last year's fiasco of the Loirston Loch stadium project, Aberdeen haven't been too keen to talk about their next steps. But now vice-chairman assures the club is still analysing chances to relocate, even if it would mean leaving Aberdeen, as STV reports. When Mother Teresa came here, she described this place as the worst case of poverty she has ever seen. One of the most terrifying slums in the world is hoped to receive a football stadium to change its image. Not for foreign observers, but for those, who have nowhere else to go. Ticket prices reached a level at which fans have simply refused to buy them. As result of a vote among away travellers of Manchester City, Arsenal will receive 900 tickets back. 09.01.2013 Poland: Legal pyrotechnics to be voted on in parliament? It seems that pressure of football governing bodies and supporter groups is paying off – amendment to safety regulations inside Polish stadia should be ready by the end of February. Changes may include legal pyrotechnics and safe standing. 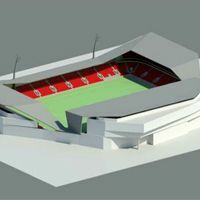 If no appeals are filed, we should know the contractors for new stadium in Debrecen within a few weeks. And if construction goes along schedule, Nagyerdei Stadion should be ready in mid-2014, according to Hoan.hu. Though no official statement was issued, 'Ellis Park' is back in official statements as name for the 2010 World Cup venue, known for the last 4 years as Coca-Cola Park. It was due to be delivered in December, but won't be ready by the end of February. Organizers argue it's caused by FIFA regulations, but it seems far-fetched, to say the least. Still, work is going forward with significant pace. 07.01.2013 England: Major athletic stadium to be closed? It was just recently named after London 2012 gold medalist Jessica Ennis. And yet today the stadium faces closure or even demolition, BBC reports. When the budget got increased from $365 million to $563 million in 2011, numerous negative comments were made regarding careless public spending. But only now it has been revealed that initially the price tag on BC Place revamp was to be within $100 million. Despite speculations that Chinese partner is most likely to build a new stadium for “Nerrazurri”, a Swiss company confirms club owner visited them to check availability and readiness for the project. We’ve been to Croatia yesterday, it’s time for Serbia today. 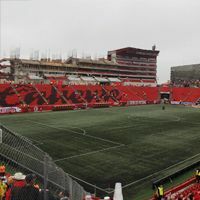 There’s a Super Liga stadium that awaits to be reconstructed and one ground that lost top-tier status recently, but after getting a make-over, at least. They play in Europe every year, but have to host home games in other cities, as no stadium suiting UEFA can be found in or around their town. 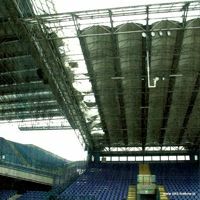 That’s why owner of Romanian “cinderella club” urges authorities to build a football arena, Ziare.com reports. Completely rebuilt premier league stadium in Pula and completely not rebuilt 2nd tier stadium in Zagreb – these are our today’s additions from Croatia. Dig in! Stalled for 4 years already, new stadium with 10,000 seats was finally granted planning permission now. 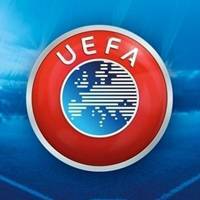 There’s still time for opposition to raise appeals, but all previous complaints were discarded, eurofotbal.cz informs. There weren’t supposed to be any events until redevelopment is finished, but now it seems there will be some major concerts before works even start. Stadium managers are a step away from signing lucrative contracts, BBC reports. It will be unique thanks to each viewer having quasi air-conditioning, but so far only the most expensive seats went on sale. And they were instantly snapped up by big companies wanting to have their spot at the venue. 02.01.2013 Ethiopia: 11 new stadiums at once? 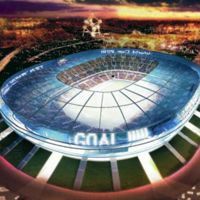 Construction on the largest one will start in 2014 – assured Prime Minister Desalegn, declaring further improvements of country’s sports infrastructure will see a lot more venues growing. An EthioSports.com report. Biggest stadiums of both countries welcomed citizens for New Year’s Eve celebrations, but in both cases these events cost lives of some participants, mostly children. At this point at least 74 people are confirmed dead, with over 320 injured.